At Safe Defenses our professional team of pool equipment installers are able to install more than just pool safety equipment. We offer a full line of pool dining, seating, and lifestyle products that will help you get maximum enjoyment from your swimming pool. Each of these lifestyle products can be professionally installed, then removed by you as needed. Add a high quality, professional grade table, seating, or other lifestyle product to your swimming pool. Available in 16″ and 30″ diameter options a swimming pool table can be easily installed into anchors professionally installed into your swimming pool or spa. Just slide the stainless steel support pole into the anchor and you have a table great for dining, beverages, and even umbrellas. We also offer installation of bench tables that add a swim up bar or table to your poolside this summer. 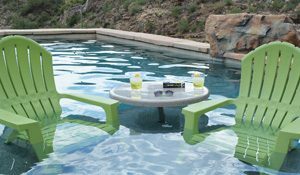 If you want a taller table for deeper water, we offer those too, just ask our professional pool equipment installers for more details. Add a seat to your swimming pool or spa using the same high quality stainless steel support poles and easy installation. Now your in-pool table has the perfect accommodation to keep your comfortable and allow you to dine and enjoy the outdoors, without stepping foot out of your swimming pool or spa.